We are a manufacturer, supplier & dealer of High Temperature Furnaces. 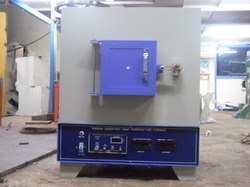 Lab High Temperature Furnace: High temperature Muffle Furnaces are designed to meet the requirements of varies customers in Industries, Educational Research fields etc. Double walled chamber outer chamber made of mild steel sheets and finished in powder coated paint. inner chamber is formed by high temperature withstand Zirconia Vacuum Board following by Ceramic fibre blankets on all the sides. Double walled door mounted on heavy-duty hinges in the front is provided with effective locking arrangements. Heating elements will be silicon Carbide Rods. Further the door is provided with door limit switch to cut off the powder supply whenever the door opened and restart when the door is closed. Temperature is maintained and controlled by Digital PID Temperature controller with Thyristor Control Device working in Conjunction with Cr/A1 Thermocouple. Supplied complete with control panel.